Yamaha Motor Establishes a Motorcycle Sales Subsidiary in India - News Releases | Yamaha Motor Co., Ltd.
Yamaha Motor Co., Ltd. (the “Company”) has established a subsidiary in Surajpur outside New Delhi for sales and after-sales service, specializing in Yamaha brand motorcycles. The new company opened its doors October 1, 2005, and will begin full-scale operations when it moves to its new building in the middle of December. The new company is known as Yamaha Motor India Sales Pvt. Ltd. (YMIS). Its capitalization is 2 million rupees (approx. 5 million yen), of which 99.99% is paid in by Yamaha Motor and 0.01% by Yamaha Motor Asia Pte. Ltd. (YMAP), a subsidiary in Singapore. The move will revamp Yamaha Motor’s motorcycle business in India. Previously, the Company’s subsidiary, Yamaha Motor India Pvt. Ltd. (YMI), manufactured, sold and serviced Yamaha brand motorcycles, but now the new company, YMIS, will take over the motorcycle sales and after-sales service functions. YMIS seeks to boost marketing capabilities, improve customer service, enhance the Yamaha brand image, and ultimately expand sales. YMIS will have about 120 employees when the company launches full-scale operation. In the first year (fiscal 2006), it plans to sell approximately 300 thousand motorcycles, worth about 10.04 billion rupees (approx. 25 billion yen). After the realignment, YMI will concentrate on the production and export of motorcycles, while working to improve quality further and reduce costs. 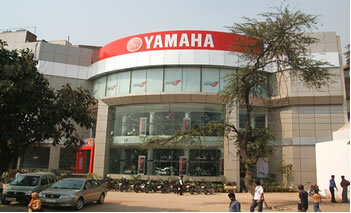 Meanwhile, the Company established its first directly operated dealership in India, “YAMAHA ONE,” this October. The facility is Yamaha Motor’s first large-scale showroom (two stories above ground and one below ground) in India, and is designed to improve the brand visibility in the country and stimulate sales. Following the establishment of this flagship in Delhi, the Company plans to open four more dealerships in 2006, and five more in 2007. At the same time, the Company is restructuring the local dealership network, helping upgrade facilities for the 50 top dealers in sales volume, based on the “YAMAHA ONE” store design, to further strengthen their sales capabilities. Yamaha Motor announced “restructuring the business foundation in BRICs” a key priority in its new medium-term management plan, NEXT50-Phase II, which runs from 2005 through 2007. Establishing the new sales subsidiary is a key part of the drive to restructure the motorcycle business foundation in India, and to boost marketing capabilities and enhance customer service. Name Yamaha Motor India Sales Pvt. Ltd. Note: Premised on an exchange rate of 2.49 yen against the rupee.